What makes Huanchaco a popular tourist attraction? Huanchaco is a relaxed small fishermen and surfers town north/west of Trujillo, in the north of Peru. In this article, I would like to explain what’s so special about this coastal town. Huanchaco is not a particularly pretty town. North of the pier much of the beach has been lost to coastal erosion. Thankfully South of the pier it remains unaffected. No, the attraction of Huanchaco is not visual. The appeal of Huanchaco comes from its location, history, culture, peacefulness, fresh seafood and strong, consistent waves for surfing. 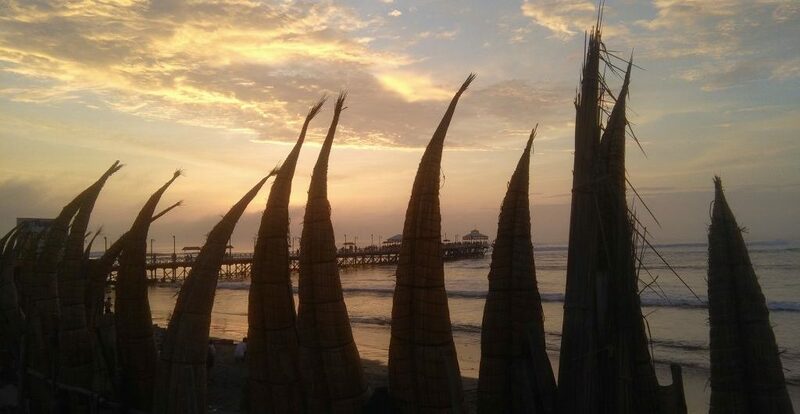 This attractive mix makes Huanchaco one of the best stops for travelers in the north of Peru! Huanchaco was the first harbor of this region when the Chimú ruled Chan Chan, and the town kept this important position until halfway during colonial times. When in 1870 the bigger harbor of Salaverry started operating, much of business went to Trujillo. 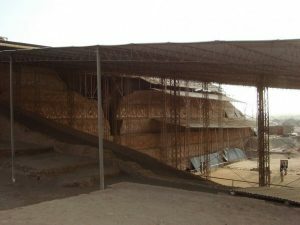 A few years later Huanchaco received a new and bigger pier to be able to transport sugar from the sugarcane plantations in the nearby Chicama Valley. When the demand of sugar transport declined, and Huanchaco couldn’t keep up with the modernization of the fishing business, its harbor lost importance. Around 1980 Huanchaco turned into a sleepy fishermen’s town and the favorite beach resort for the residents of nearby Trujillo. With more time and less industry, surfing started to become a popular sport. 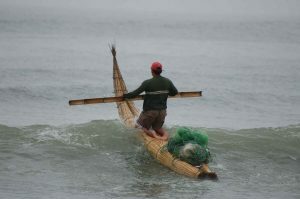 However, even now each morning the elderly local fisherman of Huanchaco still step on their little man-made reed boats and navigate through the swells of the surf to go fishing in calmer waters. Because of the way how these small boats ride the waves, they were named “Caballitos de Totora,” which means “Little Reed Horses.” Images of a Caballito de Totora have been found on ceramics over 3000-year-old from the Virú, Chimu and Moche cultures. The design and use of the Caballitos de Totora haven’t changed much. It is a unique local tradition that has survived thousands of years and is still practiced the same way to make a living for local fishermen. Some historians believe that the first Huanchaco fisherman riding the surf should be considered to be the first surfers in the world. This is a matter of opinion, but the fact is that in 2013 Huanchaco was named the first Latin American World Surf Reserve by the international Save The Waves Coalition. The coast of Huanchaco offers several year-round locations with different types of waves for beginner and advanced surfers, and since 2010 annual World Longboard Surf Contests take place. More information about this Longboard Surf Contest and the 2 times world champion Piccolo Clemente, who is from Huanchaco, can be found on WSL Longboard 2017. If you like surfing or looking for a challenge, I can recommend taking a few surf classes while visiting Huanchaco. You will need a wet suit for the cold water but the waves are excellent, and Huanchaco offers year-round surf opportunities for the beginner and experienced surfers. In summer (December until March), sunset-surfing is a favorite activity among locals, tourists, and spectators. There are many surf schools in Huanchaco, and the quality varies from very good to very bad. Renting a surfboard and wetsuit for the day will cost you 30 Soles (S/. the local currency and there go about 3.2 Soles in a US$) to S/.35 and a surf lesson of around 2 hours cost S/.70. The most established surf school is Muchik Surf. This is especially the best-equipped school for beginners, not only because of the experience from Chicho and Omar but also because of their new practice room. Surfers for Surfers and Onechako are also good surf schools with proper equipment. It is best to avoid surf school The Wave/ Esteros. 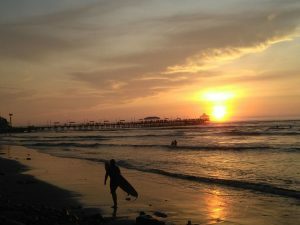 Huanchaco Surfing: Sunset surf video. Best Longboard surfer from Huanchaco: Piccolo Clemente. Visit the awe-inspiring Tombs of Huacas del Sol y la Luna, where you can admire ancient old murals in its original color! Take bus H for S/.2.00 + switching buses at the Plaza Grau roundabout (ask the driver), or take a taxi for around S/.8 from the roundabout. Another important highlight of Huanchaco is to be able to eat fresh seafood with view on the waves and the fresh wind going through your hair. There are many restaurants, and the quality of the food depends a bit on price and timing. If you want to eat a good ceviche (raw fish with lime and chili), the fish has to be fresh, so caught in the morning and eaten with lunch. Especially for the smaller restaurants, it isn’t easy to predict how many clients they will receive that day, so they often end up storing fish in the freezer for the next day. The best way to try a good ceviche will be to ask someone the evening before, or early morning if they can prepare you a lunch. Good restaurants that usually have fresh ceviche for lunch include Big Ben, Huanchaco Beach, Mochica, El Sombrero, and La Esquina. An often underestimated value of Huanchaco is that this laid back town with low prices for food and lodging is an excellent place to relax and recharge your batteries from a busy working schedule or even a busy travel itinerary. We invite you to go for a stroll on the beach, enjoy a magnificent sunset, visit the local market, read a good book in a hammock, or practice Yoga and meditation at sunset! In 2017 Huanchaco´s first official Yoga studio began operating on the top floor of the Atma Yoga Hostel. Travelers who don’t stay at the hostel can also participate in the daily Yoga and meditation classes. For the latest schedule and prices, it is best to check their Atma Facebook page. Because of the relaxed atmosphere and low costs, Huanchaco is also an excellent place to stay a bit longer to improve your Spanish before you continue your travels through South America. A good personal teacher is Sam Owen, whom you can contact by [email protected] or at Simple Spanish. Several tourists come to Huanchaco to join a volunteer project in or around town. There are many of those project ranging from poorly organized to good organized. One of the better projects is Esperanza Canina in Huanchaquito. The social business Fairmail is also worth to check out for people who want to stay longer than a month. With any volunteer project you want to join, always make sure that you know exactly what they expect from you and where your money goes before you sign up. Hotel Bracamonte, comfortable, excellent services, with a big garden and restaurant. Good for families. In a quiet area, but a bit far out of town. Hotel El Sombrero, modern, comfortable hotel. Many of their rooms have sea view, but are above their own popular restaurant and not in a quiet neighborhood. Hotel Qhamar, quiet location, with a small swimming pool and with small modern rooms with sea view. Good for couples. When they open their little bar, it might be less quiet. Hotel Las Palmeras, good middle-class hotel with garden and swimming pool at the quiet end of Huanchaco. Good for families. Hostel Nylamp, great garden, good location, an excellent Italian restaurant, and a reasonable price/ quality deal. Atma Yoga Hostel, a modern, clean hostel at a quiet location and pleasant place for people who want to practice Yoga, meditation and/ or surf. Hostel Frogs, big, well organized and popular party hostel. The place to meet others, backpackers and party locals. Recently also opened a Beach Bar. My Friend, low budget hostel that has been around for many years. Restaurants, more or less in order of price. Huanchaco Beach, According to some they have the best ceviche in town. They are Only open in the afternoon. Big Ben, quiet location, popular and good food, service, and view. Only open in the afternoon. Mochica, bit less expensive but also good food and service, stylish interior and sometimes opens in the evening. El Sombrero, popular with tour agencies because of their price/ quality rate for their food, often, but not always open in the evening. La Esquina grew in 10 years from a small one-story corner restaurant to a medium sized 3 story restaurant because of the quality of their BBQ seafood and ceviche. Opens each day from lunch until 22:00 h, or even midnight, depending on the season. Lighthouse, this Argentinian restaurant has good BBQ food and service and is for those who don’t like fish. Casa Tere, this good Italian pizza restaurant also has some great pictures of old Huanchaco on the walls. Otra Cosa Vegetarian Restaurant, has good coffee, breakfast, original vegetarian plates, and some good Dutch apple pie. Chocolate has tasty breakfast, lunches, and desserts, but closes at 18:00. Umi Sushi House & Bar offers a tasty variety of decent quality sushi at a reasonable price for sushi. Not easy to find in Las Orquideas 317. Moksha and Corazon Verde, for vegan food. Blue Mar, great lunch menu’s from 8 to 10 soles. Many cheap restaurants, including My Friend and Menu Land (best cheap hamburgers of Huanchaco), can be found in Av. Los Pinos. The new Hot Place to go out in Huanchaco is called Frogs Beach Bar and is located at the beach at the beginning of Huanchaco. Huanchaco has on average a pleasant climate as in not being too hot, or too cold and with relatively high humidity of 80%. During winter months days are often overcast. April is even known for its foggy days. Huanchaco is a small town, and the presence of municipal security cameras and police ensure the area is generally safe. Nevertheless, it is not recommended for women to walk alone on the empty beaches past the town boundaries (In the north of Huanchaco, past the last houses, or to the south, past by Parador Turístico Quibisich). The best way to get from Trujillo to Huanchaco depends on where you arrive/ depart from in Trujillo. If you arrive with Cruz del Sur, Oltursa, Civa, Tepsa, or Emtrafesa Bus, then you can take for S/.2.00 Soles the Huanchaco minibus/ combi B from Avenida España to Huanchaco. Note: watch your luggage, because these busses and combis are often quite full. You can also take a taxi from S/.15 to S/.20, depending on what time it is. If you arrive with Linea or Ittsa Bus, you can take bus/ combi H for S/.2.00, or again a taxi for the same prices mentioned earlier. If you arrive at the new Terrapuerto bus terminal South of Trujillo, then it is best not to be bothered by trying to go by bus, since you will have to switch busses, and again, it can be busy in the bus. A taxi from Terrapuerto to Huanchaco will cost from S/.20 to S/.25 for the cab. When you arrive by plane in Trujillo, the airport is located right between Trujillo y Huanchaco. A taxi will cost between 10 and 15 Soles for the cab. If you want to go by local bus, you will have to turn left after leaving the airport and walk for about 500 m to the main road. The bus is just 1.5 Sol. We also offer organized tours to Huanchaco and other highlights in the North of Peru, for example during our Essential North Peru Tour, which could be a perfect extension for any traditional tour through the South of Peru. Thanks to Kevin for his help writing this article about Huanchaco!